In 2008 the artist Jann Haworth created the comic strip, ‘Mannequin Defectors’ in which mannequins march past a street mural depicting prominent women in the arts and sciences. It was prompted by Haworth’s realisation that she could ‘barely cite thirty’ such women herself. I remembered both of these as I began to look at the data for my pilot study that looks into girls’ ideas about leadership and women leaders. 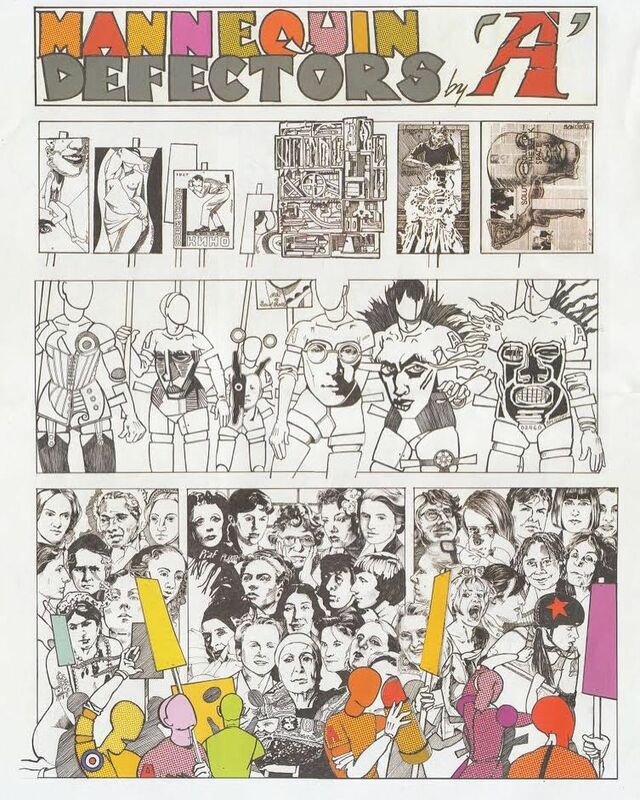 ‘Mannequin Defectors’ remains a favourite work, and I hope the RE teacher grew up to create more representative school art, but as a feminist media educator I know that the relationship between representation and audiences is a complex one that goes beyond offering media ‘mirrors’ and assuming effects. The study explores the kinds of ideas about leadership made possible and/or meaningful to girls. It seeks to understand how girls engage with these ideas via figures chosen by themselves, the discourses that surround these figures, and the media and everyday contexts and practices in which such engagements take place. An absence of visible role models in girlhood is a popularly-cited as a root cause for the shortage of women in decision-making positions in adulthood; initiatives such as Edwina Dunn’s The Female Lead, or the Biographical Dictionary of Swedish Women seek to address this shortage. However valid in themselves though, concerns about the proportion and visibility of women leaders too often translate into ‘role model’ solutions for girls that are based on simplistic ideas of gender-matching. In such solutions the complexities of relationships that young people may have with media figures, and with more locally available role-models, are reduced to a matter of inspiration = imitation; few consider the cultural contexts in which girls encounter these figures, the meanings girls attach to them, and how encounters and meanings are embedded in girls’ everyday lives and media practices. 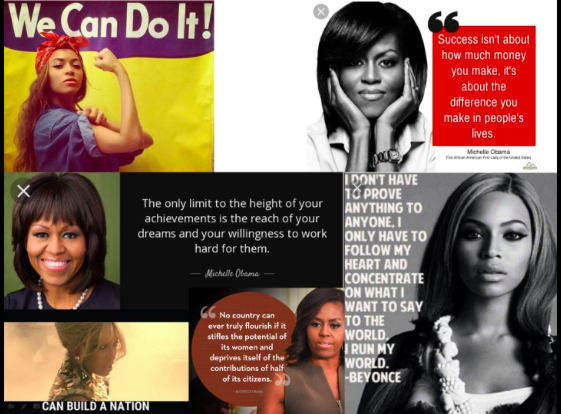 In this post I focus on two leadership figures cited by participants in school interviews and whose images feature frequently as memes in the Facebook group collages created for the project: these are Michelle Obama and Beyoncé. If we don’t take back the celebrity politician system, citizens might well face a political contest between a basket-ball player versus a football player, or a comedian versus rock star, or a movie star versus a television situation comedy star (West and Orman 2002, p.119). At first glance, the girls’ selections may seem to play into these anxieties. However, to read them in this way is to indulge in simplistic cultural hierarchisation, in which celebrity, and especially the tastes and opinions of the teenaged girl, will always occupy the lowest positions. 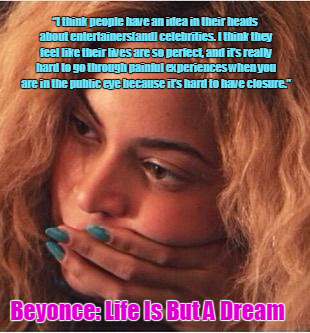 And while Michelle Obama and Beyoncé could be seen to represent Street’s (2004) distinction between the celebrity politician and the activist celebrity, this divide is not meaningful for the girls. Their discussion focuses instead on the idea of influence – who has it, how they got it, and whether they deserve it. Their distinction between the celebrity and the leader is framed in terms of merit, with the hard-working celebrity earning the status of leader. The other distinction between the celebrity and the leader is made in terms of generational appeal. Michelle Obama and Beyoncé, the girls feel, do more than ‘sit in a room with a giant bunch of people and argue about taxes and stuff’ and instead are constructed as highly accessible figures who model hard work and the material successes it can bring. InMichelle Obama, participants see qualities of accessibility and everydayness that both sit alongside and are the source of her influence. 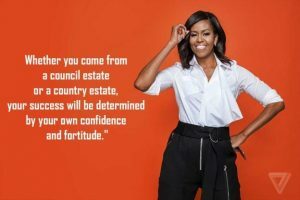 Her accessibility is partly framed through her status as a Black woman – this is central to their perception of her as a good leader; one participant describes her as ‘someone who came from a background or was born as a minority, can have that opportunity…I think that makes her be a leader’. 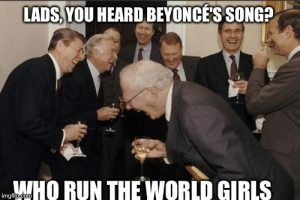 Michelle Obama and Beyoncé can also be seen as occupying the same taxonomic category of ‘leader’ for girls when considered within contexts of digital consumption and reproduction. With the shift away from more traditional forms of news consumption and civic engagement to new forms of online participation, both are figures that girls encounter and share in their social media activities, especially via memes. Rather than providing evidence either that popular culture has the potential to energize the public sphere, or the contrary that those who engage with celebrity cultures are unlikely to engage with politics, the ways in which girls talk about their favourite leaders suggests that they offer a nexus around which ideas about power, influence and gender coalesce and are made accessible for interrogation as well as reproduction. Like Haworth’s ‘Mannequin Defectors’, encounters with the role-model images provoke a consideration of what they stand for.